Mailing List Manager's intuitive icon-driven user interface makes managing your mailing list as easy as possible. Every function is right at your fingertips. Add, edit, or delete email addresses, export your list to text or excel-ready files, or send an HTML or text-based newsletter or mailing. Use Mailing List Manager's code generator to automatically write the HTML code you need to add a mailing list subscription form to your web site. 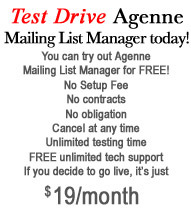 Using the Administrator to manage your mailing list is simple and straightforward. Should you encounter any difficulty, context-sensitive help is available throughout the Administrator to guide you through any operation.